Let's face it, most modern witches or druids would like to be able to boast an ancestor who was a bona fide practitioner of the craft. It doesn't seem to matter how much experience one has as a neopagan, a real witch, druid, wise woman or cunning man in the family history gives that little extra kudos. Some people I know are lucky enough to have their grandma's genuine handwritten book of spells sitting in the bookcase. And, I suspect, that if most of us were able to trace our ancestry far enough back, or find enough documentation, we would probably find a witchy ancestor or two who fit the bill. But, of course, the true spiritual importance of ancestors for modern day neopagans - witches and druids alike - is far more than simply being able to boast an impressive magical heritage. It is about honouring those who have gone and have shaped our own lives, "the ancestors of blood, the ancestors of place, and the ancestors of tradition". And most of the druid rituals I have attended have paid special importance to honouring the ancestors by inviting their blessings in the ritual space along with the spirits of place and of nature. 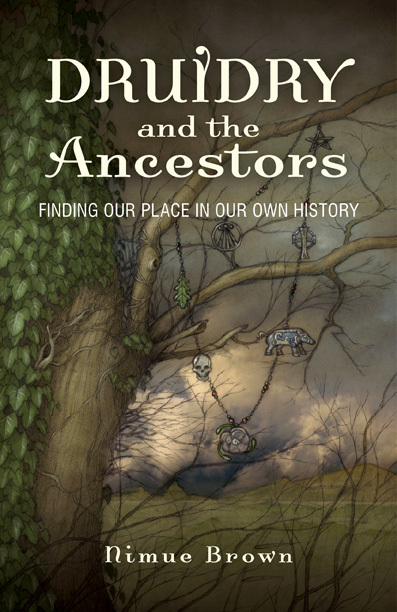 A new book by druid Nimue Brown called Druidry and the Ancestors: Finding Our Place In Our Own History is an exploration of "how we imagine and construct our ancestors, and what the implications are of the ways in which we think about them." Nimue says: "This is a book about making peace with the ancestors, understanding their legacies and their ongoing presence in our lives, and exploring how ancestry impacts on community, and ideas of race, nation and culture." It is not so much a history book, as a book about the way we relate to various concepts of history - family history, the history of our country and the history of paganism. It looks at the stories we weave about our past, and why they are important to our spirituality. It examines how history books - particularly about ancient history and the druids - can be contradictory and misleading, yet the various insights they give can inspire modern practice. Even the tales we tell ourselves of our fantasy ancestors - the witchy granny we would love to have had even if we have no hard proof she existed - can motivate us in our search for spiritual truth. Publisher Moon Books says on its website: "Ancestors are part of our shared humanity, we all have them. Ancestry in the guise of race, has been used as a tool to divide. Even so, it might yet help us move in greater harmony. Are we playing out the motifs of our family history, or making our own lives? Are we held back by the past, or empowered by it? And why does any of this matter? Druidry and the Ancestors will take you on a journey into how you imagine yourself, and how you can take control of your identity and future." Samhain is the time of year when many modern pagans, witches and druids alike, remember relatives and teachers who have died as well as honouring those who lived in the land before us. It is a time when the veil between the worlds is thin and the ghosts of our ancestors of line, place and tradition can return to visit the living, perhaps to give words of wisdom from the past. Druidry and the Ancestors offers insight into how we can make sense of all those stories of our ancestors, and how we can relate to them should we contact their spirits through our rituals, meditations or dreams. Author Nimue Brown is an OBOD trained druid, a founding member of Bards of The Lost Forest and Druid Network member.